WILMINGTON, MA - Bruins General Manager Peter Chiarelli announced to media on Friday that forward Matt Fraser has been signed to a one-year, two-way contract. Fraser was a restricted free agent. 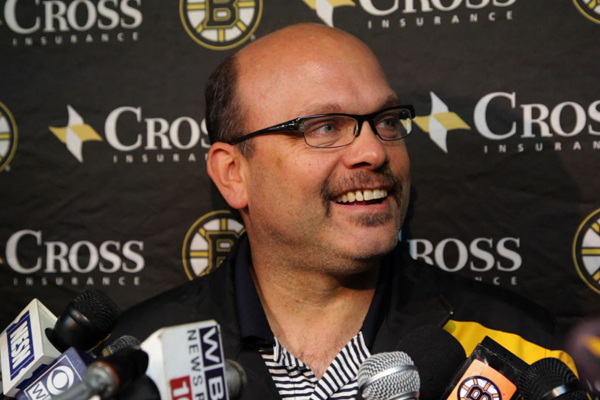 He made his first appearance at the Bruins' informal practice on Friday at Ristuccia Arena. The winger appeared in 14 games for the Bruins last season, in addition to playing the first four Stanley Cup Playoff games of his career and scoring the overtime game-winner in Game 4 against Montreal to even the series. He played through a broken right foot in the series. Following the informal skate, Fraser said that he's ready to go for training camp, though he had to make modifications to his offseason training after surgery. He had a plate and six screws inserted. Chairelli also disclosed that defenseman Steve Eminger has been signed to an AHL deal with the Providence Bruins, and will be attending training camp with Boston. He's been skating at the informal practices all week. The 30-year-old is a veteran of 488 NHL games with the Washington Capitals, Tampa Bay Lightning, Florida Panthers, Anaheim Ducks and New York Rangers. he spent the 2013-14 season with the AHL's Norfolk Admirals and in the KHL with CSKA Moscow. Eminger was drafted 12th overall by Washington in 2002. A longtime friend of Bruin Gregory Campbell, the pair both played on the OHL's Kitchener Rangers in 2002-03. Campbell and Eminger grew up training together at Campbell's family home in Tillsonburg, Ontario (the BostonBruins.com "Bear Tracks" crew got a glimpse at that in the summer of 2012). In addition to the news about Fraser and Eminger, Chiarelli said that forward Ville Leino has been invited to training camp on a professional tryout basis. Leino is an unrestricted free agent. Leino was limited to 55 games with Buffalo in 2013-14 and just eight games in 2012-13 due to injury. The 30-year-old native of Finland has put up 119 points (40 goals, 79 assists) in 286 games throughout his NHL career that began in 2008. "[Eminger's] signed to American league deal, yes, he’ll be at camp. And we’ve actually also, we haven’t announced it, this is my omission, [Matt] Fraser we’ve signed. He’s at a one year, two-way deal. And we invited Ville Leino to camp, he’s coming to camp."